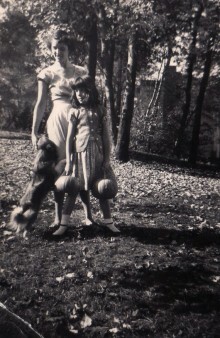 My mother, Grace Mary, loved Halloween. When I was little, she crafted memorable costumes for me. The first costume I remember was simple and characteristic of my mother’s humor. She transformed me into Gus the Ghostwriter from Crockett Johnson’s Barnaby and Barnaby and Mr. O’Malley cartoon books, popular during World War II. She covered the toddler me from head to toe with a simple sheet, cut out the eyes and embroidered black cotton glasses and belted the outfit with a lightweight chain just like the nearsighted comic anxious Gus. When I was four she made my favorite, preparing it over several weeks of delicious suspense. First she soaked an old pair of footed one-piece pajamas in spent coffee grounds and hung them on a line in the basement to dry. A dear friend of the family, Hazel Lumbert, my father Charles’s former secretary the year he wrote the PPR, provided a realistic painted molded-rubber mask for the outfit. Lastly, she enlisted my help to cut out and color four cardboard flaps to disguise my gloves and shoes as …paws. Came dusk she dressed my wriggling animal self as a wonderful wolf! As I set out on all fours to prowl around the kitchen, the back doorbell rang. Mr. Luongo was delivering fresh laid eggs. My mother opened the door to greet him. When I appeared around the refrigerator as a wolf, he almost dropped all the eggs. Because my mother had so skillfully engaged me in the process of making the wolf suit, I relished the power of being scary. Not too much later, she turned me into the Easter Bunny with the hallmarks of Lewis Carroll’s White Rabbit: red vest, perky ears held upright by stuffed Kotexes, a prominent gold watch, and white gloves. As Gus was a scared ghostwriter, her creation of me carrying offerings to our neighbors of painted eggs on a silver tray celebrated Easter in a secular way with literary elegance. I believe now that her energy and imagination at work for me was spiritual. She taught me the real meaning of All Hallow’s Eve and that the spooky celebration heralds two days of honoring the dead, first saints and then all souls. As the early November days passed, my mother would grow sad. She was remembering her mother, Grace Louise, who in 1900, married Frank Seeley and moved from prosperous Leavenworth, Kansas, to the isolated boom mining town at 9,400’ of Goldfield, Colorado, above more famous Cripple Creek. In 1902, Thomas D’Entremont Seeley was born. Because of the altitude, threats to health and difficulties for children, the family moved to Colorado Springs. Frank Seeley, Jr. was born in 1908. My mother was born during the Battle of the Marne, on the Feast of the Trinity, September 14, 1914. I know she had fun growing up zestful for horse riding, camping, hiking, making and cooking over fires. Her older brothers teased her devotedly. They told her to dig a deep hole in the back yard and she would reach China. She loved a big white stuffed bear named Snowball. She and her pals loved to visit the Chinese curio dealer in town. They would knock on the screen door and ask if they could enter, announcing, “We smell punk.” The storekeeper would invite them in, “You sit in the corner and no one will notice.” All my growing up my mother delighted in spontaneous witty wordplay: puns, repartee, telling quotes. In her high school years, Grace Mary deepened her love of language. She wrote poetry and formed a writers’ circle. With her lifelong friend, Joanna Jolly Ritzman she supplied all the senior quotes for their yearbook. Although both of her brothers in turn went to nearby Colorado College, the Great Depression was gathering, so that by her graduation in June, 1932, there was no money for her to attend college. By documenting in her book The Invisible Scar the Depression era loss for women in opportunities for education, employment and vocation, Caroline Bird has helped me understand Grace Mary’s lasting sorrow for her lost chance. I do not know what my mother did for herself after graduation beyond writing, cooking and homecare for her family. Before their marriage, 2 December 1937, she had published thirteen poems, more than my father had papers in print. She did have a well-loved black and gold-trimmed Remington portable typewriter that was only replaced by a snazzy Olivetti Lettera 22 teal blue portable when I was in high school. It is indelible on my heart that on the afternoon of November 4, 1932, eighteen-year old Grace Mary and sixty-year old Grace Louise went shopping together. They arrived home, and Grace Louise starting coughing. Grace Mary held her but the coughing would not stop. Within 15 minutes, Grace Louise died of a collapsed aorta in her daughter’s arms. Knowing this story and impatient with my own sorrows, in her 19th year, my daughter Maria exclaimed to me, “You carry your mother around like a dead ghost.” I do. I do. I have felt it a duty and a love to make vivid to my children the dear and the good about my mother, and her woundedness. As my suitor, their father fell in love with my mother, her humor, her cooking, her hospitality despite her deadly addiction to alcohol and barbiturates. And I miss her. I long for her witty and comforting mothering that shone through the bad periods of our life together. Above all, I have tried to keep healthy, to understand her illness and grief, my own vulnerabilities, and to propagate in a hungry world, the nurturance and love for her child, that I always felt in her company. Holy ghosts and Holy Spirit.